Gaur Saundaryam-A Luxury Property Plan for Buyers! If you are seeking for high rising and luxury project of Gaursons, you should check out Gaur Saundaryam resale flat at once. This magnificent residential project is located at Noida Extension, and encompasses outlandish apartments in 3BHK & 4BHK range. The giant has made all apartments robust, well-constructed and in modern look too. Also, you will be pleased to see brilliant housing comforts in each apartment such as stunning kitchen, elegant bathroom, spacious hall, bedrooms, and modern looking windows, doors, wide balcony, etc. Furthermore, the apartments have made fully finished and polished too to look beautiful. It’s not over, the apartment possess luxury outlook, ventilation and larger space that will be enough to a big family to live happily. Author Pradeep KumarPosted on December 2, 2018 Categories real estateTags Gaur Saundaryam, Gaur Saundaryam apartment, Gaur Saundaryam Noida, Gaur Saundaryam Noida Extension, Gaur Saundaryam resale, Gaur Saundaryam resale priceLeave a comment on Gaur Saundaryam-A Luxury Property Plan for Buyers! Gaur Saundaryam is versed with many top-class amenities such as jogging track, garden, parking, Spa, swimming pool, gym, kids’ play area, squash, badminton court, water supply, power backup, security, tennis court, and so on. Besides, the site is also close to hospital, shopping mall, school, college, bus stand, metro station, and many more. Moreover, the location gives accessibility via NH-24, FNG Expressway, DND Flyover, etc. Thus, it would be a nice deal for home buyers to book flats in this awesome project as soon as possible. The specifications of project include 9 towers and 1200 units. The Gaur Saundaryam project whole project covers area up to 18 acres. Moreover, the location is also full of greenery and is eco-friendly too. 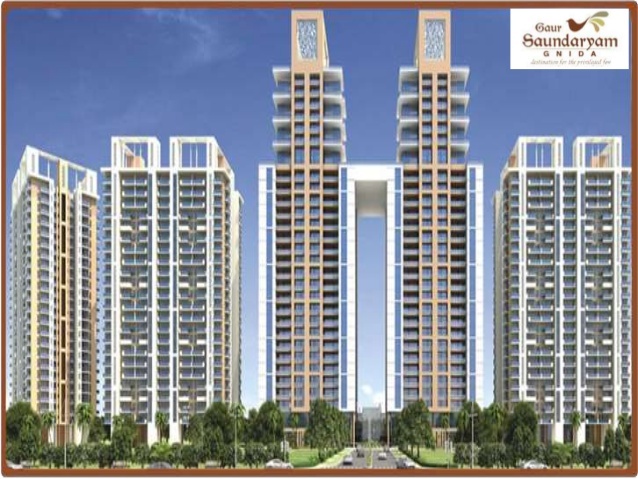 Under Gaur Saundaryam resale Units offer, you can buy stunning apartments in 3BHK and 4BHK ranges at reasonable prices. The apartments are specious and have been made furnished with all necessary housing facilities too. Moreover, the buyers will be benefited with some more attractive amenities in this project such as play ground, garden, jogging track, swimming pool, gym, club house, CCTV, badminton court, Spa, etc. With such amazing features, this project seems to be good to invest and book units under resale offer of this project. Gaursons makes the life easy to live for people by developing modern design residential projects time and again. However, many families are looking for Gaursons new project named Gaur Saundaryam, which is located at Noida Extension, Tech Zone-04. This super housing project includes brilliantly designed apartments in 2BHK and 3BHK ranges. All apartments are of top-quality and have been adorned magnificently. The giant has been provided all necessary housing benefits in each villa such as kitchen, hall, bedrooms, bathrooms, lawn, balcony, doors, windows, etc. Moreover, the size of apartments may vary between 1500 sq. ft to 2365 sq. ft. Moreover, the site is also lush and is blessed by natural greenery too. Gaur Saundaryam Noida Extension makes the difference by offering some fantastic amenities like club house, garden, parking, gym, swimming pool, playground, power backup, water supply, jogging track, etc. Moreover, the project location is also close to shopping mall, metro station, bus stand, NH-24, FNG Expressway, etc. So, it is high time for home seekers to book multiple units in this outstanding project now! Your search for a ravishing apartment in Noida extension will end at Gaur Saundaryam. It is an absolutely perfect residential project that includes high class apartments in 1 BHK to 4 BHK. All ranges of apartments are available at reasonable prices. Besides, you will find more facilities in this project such as club house, gym, parking, garden, water supply, etc.